The bulk of Latin America’s urbanization is taking place behind the scenes. In addition to the massive cities and conurbations up and down Latin America’s Atlantic and Pacific coastlines, there are another 310 cities with populations over 250,000 and another 16,000 smaller towns. Today, 82% of the population lives in cities. Already some 93% of Venezuelans, 92.5% of Argentinians and Uruguayans, 90.6% of Brazilians, and 89.3% of Chileans live in cities. The move to the city occurred at breathtaking speed. In 1950 there were 69 million people living in cities and by 2025 there are expected to be 575 million there. The centre of economic gravity has also shifted to cities, with at least two-thirds of the region’s GDP based on services and industry in urban areas. But the dividends of urbanization have not been shared equally. Although the elite have done well out of Latin America’s urban revolution, the poor still struggle to access basic services, including security, public transport, water and sanitation. Latin America’s cities are the most unequal on the planet: roughly 111 of the region’s 588 million inhabitants live in slums. Although poverty reduction was prioritized by many governments, Latin America is home to 10 of the 15 most unequal countries in the world. 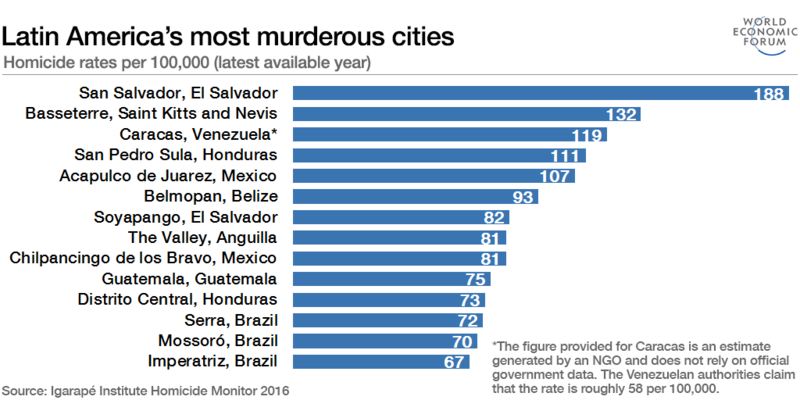 What's more, in 2015, the region was home to 47 of the 50 most murderous cities on earth. Cities in El Salvador, Honduras, Mexico and Guatemala were at the top of the charts. Meanwhile, Brazil fields a whopping 32 cities on the list, most of them clustered along the northern and eastern coast. There are strong indications that lethal violence will continue escalating in Latin American cities in contrast to virtually everywhere else. Not surprisingly, urban dwellers single out insecurity as their over-riding priority. 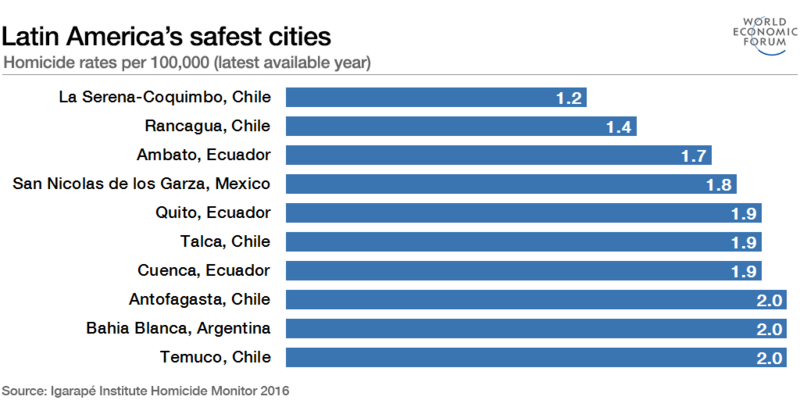 Many Latin American cities suffer from a range of risks contributing to fragility. It is not necessarily the large cities, but the fast-growing ones that are most susceptible. As a new data visualization on fragile cities shows, Buenos Aires, Mexico and Sao Paulo have violent crime rates that are below the national average. However, those cities growing at over 4% a year – such as San Pedro Sula (Honduras), Lagunillas (Venezuela), Villavicencio (Colombia), Santa Cruz (Bolivia) and Ciudad del Este (Paraguay) – tend to experience disproportionately higher rates of homicide. Other risks of urban fragility include weak security and justice institutions, youth unemployment and especially social and income inequality. For example, cities like San Juan, Santo Domingo, Salvador and Port-au-Prince register unemployment rates stretching from 14% to 49%. The more unequal a setting, the higher the rates of violence. The news is not all bad. There are some promising examples from across Latin America of governments - especially municipal authorities – incubating new approaches to designing-out violent crime. Many of them are adopting data-driven approaches to improving public safety. Their successes are neither incidental nor accidental. They are not getting results by reinforcing police, increasing penalties or building more prisons, but by experimenting with preventive approaches, replicating innovations and scaling success. There are several priorities for Latin American cities – especially the smaller and medium-sized ones. First, public safety and security policies and programmes must be data-driven. Remarkably, less than 6% of public security and justice measures undertaken across Latin American and the Caribbean have any evidentiary base. Even so, there are certain targeted measures – focused deterrence, cognitive therapy, childhood interventions – that can generate positive crime prevention dividends. There are other popular activities – community policing, gun buy-backs, abstinence-only programmes – that are less effective in bringing violence down. The mobilization of solid evidence to drive interventions is a necessary condition of success. Second, focus energy and resources on very specific places, people and behaviour. This is because criminal violence is often sticky. About 50% of homicidal violence in cites takes place in less than 2% of street addresses. Often just a small number of people are most at risk of perpetrating or being a victim of a crime in particular neighbourhoods. About 0.5% of the population is responsible for 75% of murders. If crime prevention in the city is the goal, open-ended community-based activities are the wrong way to go. Rather, coordinated activities emphasizing hot spot and problem-oriented policing must be highly targeted, diligently implemented and adequately resourced. Third, we must explore careful experiments in decriminalizing and regulating drugs. A “drug free world” is a fiction. Regulation is not the same as legalization. There are a tremendous range of options residing between outright prohibition and legalization. City mayors are experimenting with decriminalization of use, harm reduction and prescription-based approaches, strict market regulation, loose regulation, and even commercial promotion. There are different ways to practically make drugs available in a controlled manner, including medical prescription, sales in pharmacies, licensed sales and licensed premises, personal cultivation and users cooperatives, and even unlicensed providers. Fourth, take action to strengthen social cohesion and improve underlying social and economic conditions in specific marginal areas. While difficult, the fostering of strong bonds and a sense of mutual responsibility is a critical step in improving safety and security. This means real investments in improving tangible public goods and restoring the resilience of the state. Good examples of this include predictable public transit, improvements in housing and neighbourhood conditions rather than relocating populations, and even conditional cash transfers and support to single parents. These four pathways are not theoretical constructs. They have been tested and applied with success in cities like Bogota, Ciudad Juarez, Medellin, Mexico D.F., Santiago de Chile, Sao Paulo and more. The key is that city governments, private sector actors and civil society groups make a plan and stick to it. A new study by the Igarapé Institute and the Inter-American Development Bank in cooperation with the World Economic Forum reviews 10 cases where highly targeted reforms generated important returns in public safety.